Oh! lol. I thought loop really meant loop around the same thing over and over again. And yea, some relics of old ideas are still left in the script as my dreams of having an scv rush AI fell apart pretty quickly. I'll be updating this as well as a very rudimentary tvz. It doesn't work right at all, but at least it walks all over blizzard z easily . It will die to a 4 pool though. I don't know what to do about that since no micro marines and no pulling scv= dead. Hell, I don't think I can beat a 4 pool without dragging scvs. 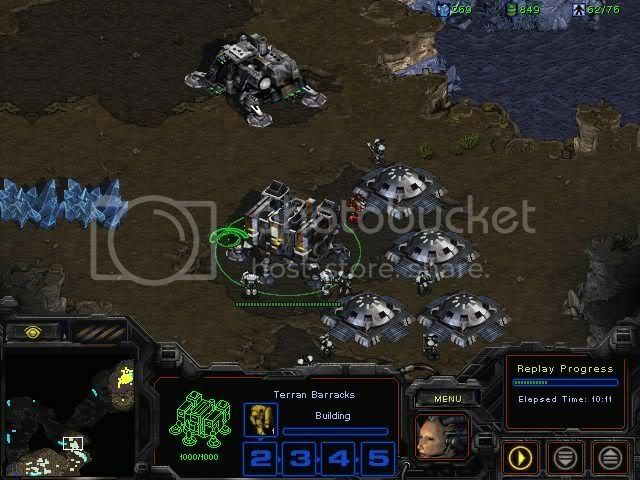 Try your Ai out vs. Blizzard and see how it does. I know I can just pit it against Blizz Z or P, but my mod would have replaced the default ai though? Thanks for the help. I'm actually quite satisfied that the AI maxes out in 22 minutes with decent upgrades. Yea, this will be a non-cheating AI though if anyone wants to eventually adapt this for something else, that's fine too. The tvz one is much more of a chore. Units are all over the place, and weird building placements make this a challenge. I have no idea how I'll program tvp. I wish I knew how to make the AI halt so much when it expands. Currently, the tvz ai is pretty weak early on, though in longer games it carries a nasty surprise. edit: If you guys ever get the AI fusion going, would you be able to import the existing scripts people have already made? Anyhow, the script is looking a lot better. Try playtesting it 2v1 and see what you think. It seems to take a while to attack; I'd like to fix this. I'm also considering scrapping the mass tanks in tvt and resorting to air (bcs, dropships, and wraiths) since the AI has a hard time managing those bulky metal units. If you mean for testing your Terran against Blizzard's Terran, if you're familiar with StarEdit one solution for this would be to create a UMS version of a melee map of your choice. Set yourself up as an observer, and create two AI players. Tell one of the AI players to run "Terran Custom Level" and the other to run "Terran Expansion Custom Level" - yours will be TMCx, or Terran Expansion Custom Level. The other one is TMCu. 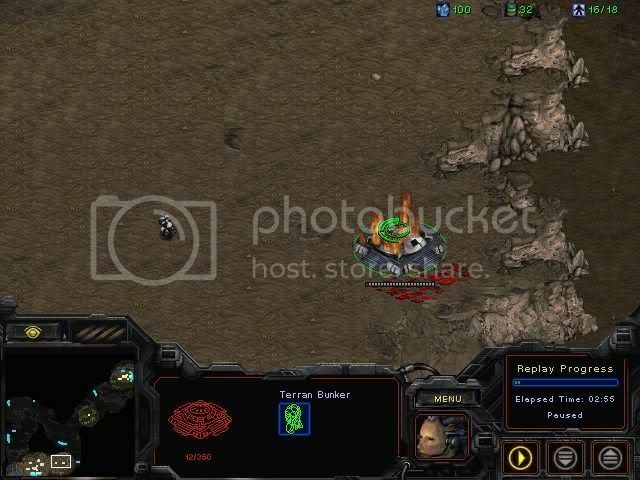 Now you can leave it like this and just test it against the vanilla Starcraft AI, or if you want to try it against the Brood War version so your enemy is using Medics, simply export Blizzard's original TMCx script, and edit the "TMCx(0, 101, aiscript)" line at the start of the file to read "TMCu" instead and import that into your AI file along with your Unleaded AI. Then you can run the UMS map for a test. It might be easier still to use some of the blank AI replays provided here on this website, but since I haven't had a need for those yet and haven't used them I can't explain how to use them. There's probably instructions included with them. I might try your AI out soon and leave you some feedback. EDIT: Oh yes, quick note - if you go the UMS map route, make sure you tell the AI players to change their alliance status to eachother to 'Enemy', since they're allied by default. There is an easier way to do it that doesn't require a custom UMS map, you can check out Entropy II to see how its done (its also explained somewhere on the forum, but i cant find where). To do it you will need to use PyAI, then don't put the scripts in with the default AI ID's (as in TMCu, TMCx, etc), use custom ones like _MyT and HisT, then make a new TMCx which is uses a random_jump to decide if it does to _MyT or HisT (i think you may have to put a wait before the random_jump to ensure they are fighting against each other instead of themselves). Anyway, happy holidays! I'm going to download this now and give it a spin sometime today. I'll put some feedback here after I do. Looking forward to trying it out. If I force the AI to cancel the expansion, it well... just gives up for a while. Also on maps like hunters, the ai chooses to expand to really odd spots. By "force the AI to cancel the expansion" do you mean destroy the SCV building the new Command Center? If so, that seems to be inherit issue with the unit behavior AI. SCVs are dispatched to repair damaged buildings, but I have never seen the AI send one to finish the construction of a building that another SCV failed to finish. I don't know if there's anything that can be done about that from the aiscript.bin side of things. Not even killing the scv, I can attack the command center itself and the ai cancels it. 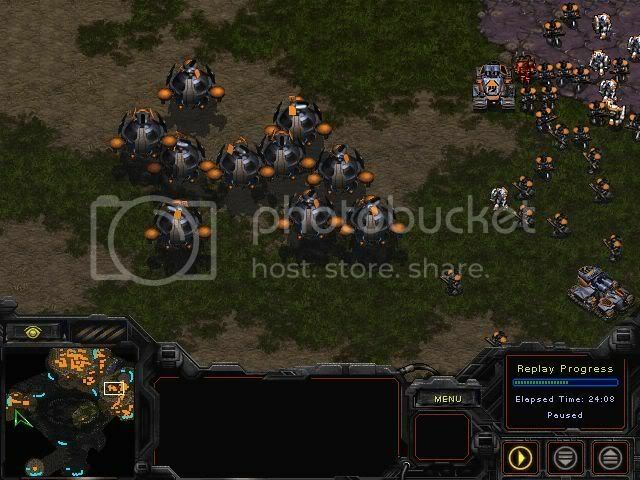 Anyhow here's a few pics of the thing in action against the poor Blizz AI using the blank replays. I just set up a TvZ computer match a bit ago like you posted screenshots of here and it turned out the exact same way. Although, the Bunker did fare a bit better with about 87 hit points left in my game. Honestly I can hardly tell this is based off of Blizzard's default Terran AI. 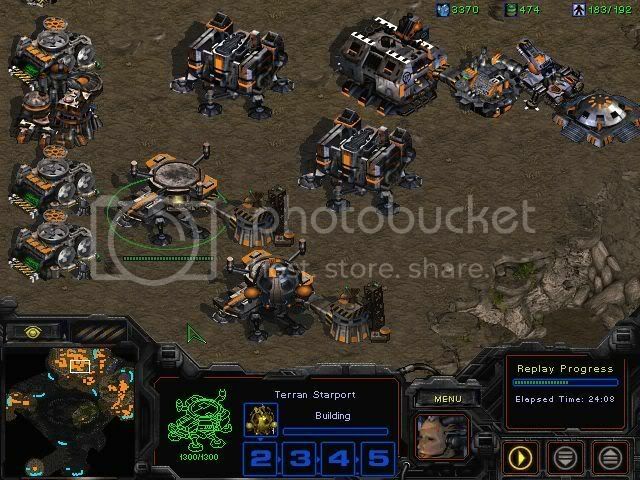 Unleaded Terran put the boot to the Zerg with its very first attack, even though the Zerg dropped units on top of their tanks with Overlords while his attack force was trying to circle around to come up the ramp. That's after repelling both the Zerg's 4-pool and later a standard Hydralisk/Lurker combo attack with minimal losses. Not bad at all! I did want to suggest though that you maybe drop one of the seven Barracks in the main. Or move it to the expo if you really want it. The main base (on Lost Temple anyway) quickly filled up and a pair of tanks and an SCV got jammed in (see screenshot). I've seen far worse jams though so that's not so bad. Unfortunately the Dropships don't really seem to ever help units that are stuck between buildings unless they want air transportation to get somewhere... although in this particular instance the deployed tanks here would have been a nasty threat for Zerglings, if any had gotten around the fortification at the expansion. Speaking of which, that heavily defended expansion works great for Lost Temple, but on other maps where access to the main base might not be routed through the player's natural expansion, that lone Bunker might not be able to hold off a large attack force long enough to protect all the factories until more units are produced. Might want to add a second Bunker at some point. Just a thought.